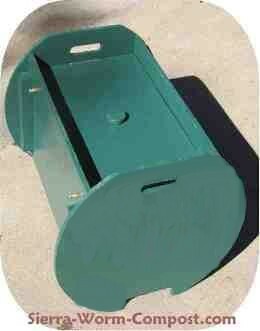 Worm bins are usually made from plastic totes or buckets to concrete cinder blocks and wooden bins or boxes. If you're not sure which material would make the right bin for your situation, you can look at the pros and cons of the three materials for help in your decision. Very inexpensive compared to wood or cinder blocks. Many sizes and their weight if far less than wood or cinder blocks. Smaller sizes are convenient for apartment, classroom and under the kitchen sink. Can be stacked as units. Long-lasting material if kept within suitable temperatures. Plastic does not “breathe” like wood and moisture and heat can build up very quickly if too much feed is added. 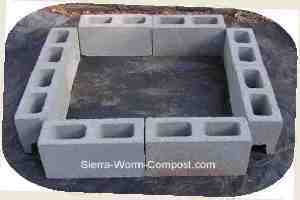 Cheaper material for larger outdoor worm farm. (about $1.75/block at big box store)Dimensions are usually 8"x8"x16". Can easily reconfigure bin shape or height as needed by adding more layers of block. Bed stays cooler in summer and warmer in winter than wood or plastic (Source:Earthworms for Ecology & Profit). Heavier than wood or plastic (28-30# each)- big factor if you have physical limitations. Limited to use in larger outdoor areas. More esthetically pleasing than plastic. this worm compost bin plan or this one. If you have the carpentry skills you might want to build a flow- through bin. That's one in which you feed from the top and harvest castings from the bottom. Take a look at this. 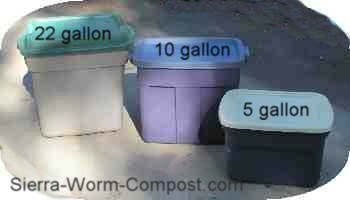 ~ How big should my bin be? Generally, your bin should accommodate either one sq.ft. of surface area per pound of waste per week or 2 sq ft of surface area per person. ~ Am I going to compost inside or outside? That will most likely be dictated by your living environment(apartment, city lot or acreage) and climate. These are a few factors that will effect the size and material of your worm bin that need to be considered for successful worm composting.